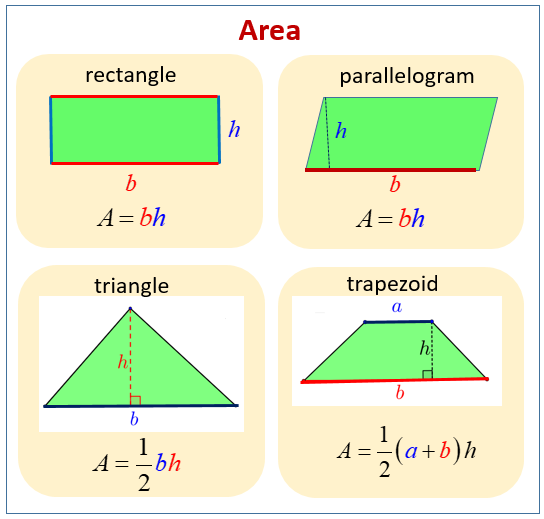 The following figures give the area formulas for rectangle, parallelogram, triangle, and trapezoid. Scroll down the page for more examples and solutions. The area of parallelograms formula is derived from the area of a rectangle. By drawing an altitude from one vertex in a parallelogram and translating the right triangle, a rectangle is formed. Therefore, to calculate the area of a parallelogram, multiply a height by the corresponding base. The corresponding base is the side perpendicular to the height. Related topics include area of trapezoids and rhombuses. How to find the area of any parallelogram using rectangle area formulas. How to derive the area of a triangle formula using the rectangle or parallelogram area formula. The area formula for a trapezoid is found by making a parallelogram made up of two congruent trapezoids. To do this, copy a trapezoid, rotate the copy 180 degrees, and translate to create a parallelogram. The area of a parallelogram is base times corresponding height; since there are two trapezoids, the area of trapezoids formula must be divided in half. Since the bases are not congruent, they must be summed separately. How to derive the area of a trapezoid formula using the area of a rectangle. Solving formulas for a variable is a critical skill in the Geometry area unit because many problems will give the area of a polygon and ask for a side, height, or some other dimension. In these cases, simply substituting and typing into a calculator will not yield the correct answer. The successful Geometry student must be capable of substituting into a formula and then solving formulas for the one remaining variable. How to strategize about solving formulas for variables; how to solve the area of a rectangle formula for base and height; how to solve the area of a triangle formula for base and for height.